Here is an unusual free, printable coloring page showing the British flag and hello Kitty - it's rather cute and I made it for all of you in the UK and for those who wish they were in the UK. 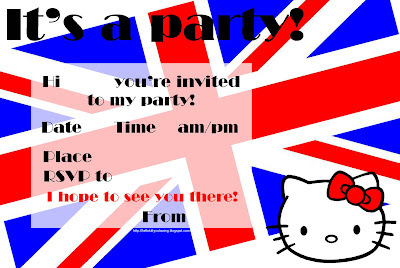 So, if you want to fly the flag at your next party - use this hello Kity free printable invite to invite your guests. Click on the invitation and it will open nice and big. Then print.